The summer of 2009 revealed two inconvenient truths about vaccination: first, the Gardasil vaccine is not as safe for girls as the government, medical organizations and Merck have said it is; and second, the H1N1 influenza pandemic is not as serious as health officials are telling us it is. Which means that fast tracked swine flu vaccines children will get in schools this fall may end up being more risky than getting the flu. On August 19, the Journal of the American Medical Association published two important articles written by doctors questioning whether HPV vaccine benefits outweigh the risks of recommending it for all young girls. The intellectually honest doctors publicly criticized the aggressive marketing of Gardasil vaccine by Merck and certain Merck-funded U.S. medical organizations and asked for more scientific evidence that universal HPV vaccination is necessary, safe and effective. Back in 2007, the National Vaccine Information Center warned that many girls given Gardasil shots were losing consciousness within minutes or hours. Some girls have left doctors offices and fallen unconscious while driving and had car accidents. This brings up the little known fact that four girls who got Gardasil in Merck’s pre-licensure clinical trials died in car accidents. How many of those girls suddenly collapsed while driving? There were 32 reports of Gardasil-related deaths between 2006 and the end of 2008 but only 20 of these death reports had enough information to be followed up. There are now a total of 43 deaths that have been reported. How many of those Gardasil related deaths cannot be evaluated because of incomplete information? This is an outrage. 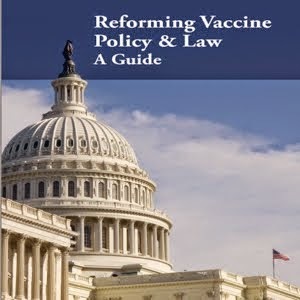 Under the National Childhood Vaccine Injury Act of 1986, it is a federal legal requirement for any person – a doctor, nurse or any person who gives a vaccination in America – to file a report with the federal government whenever a vaccination is followed by a bad health outcome, especially a hospitalization, injury or death. Vaccine providers are NOT supposed to be notifying the vaccine manufacturer – which clearly is like flushing the vaccine reaction report down the toilet – they are supposed to be notifying the government. And health officials at the FDA and CDC are supposed to be analyzing each and every report of a serious vaccine injury or death. FDA and CDC officials admit that there is underreporting of vaccine-related bad health outcomes. In fact, some studies say that less than 10 percent or even less than 1 percent of serious vaccine adverse events are ever reported. In 2005, the National Vaccine Information Center and other parent groups called on the CDC and FDA to open up those closed government vaccine monitoring databases to public scrutiny. So far, most of that vaccine reaction data is still hidden from public view so it can’t be independently verified. If the government can let vaccine manufacturers fast track Gardasil vaccine but can’t compel the drug company that makes the vaccine or doctors giving the vaccine - who are shielded from liability - to report each and every death and serious injury that follows vaccination, why should we believe anything government health officials tell us about the safety of vaccines? Why should we believe that the experimental swine flu vaccines being fast tracked with only a few weeks of study in healthy children and adults are going to be safe and that all vaccine reactions will be reported to the government and then properly followed up? In the early 1980’s, parents of DPT vaccine injured children worked very hard on getting informing, recording and reporting safety provisions of the National Childhood Vaccine Injury Act of 1986. We wanted to make sure everything was being done to help prevent vaccine injuries and deaths. Little did we know then that those safety provisions would be blown off by doctors and vaccine manufacturers shielded from liability in that law. And now, today, we have swine flu vaccines that are being rushed to market with even less testing that the fast tracked Gardasil vaccine had, with the justification that there is a public health emergency. What public health emergency? As everyone knows by now, the swine flu is no more serious than the garden variety influenza that goes around every year. Just like everyone knows by now that most cervical cancer can be prevented with regular Pap screening and that the very expensive HPV vaccine is questionable at best. 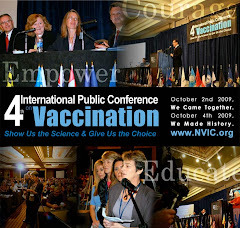 If you want to learn more about vaccines and how to be a vaccine safety and informed consent advocate in your community, come to the Fourth International Public Conference on Vaccination being held October 2-4, 2009 in Washington, D.C. For more information, go to http://www.nvic.org/.